The Stark County Dental Society was organized in the banquet room of the Courtland Hotel, Canton, Ohio, November 4, 1909. The object of the Society was “to promote the public welfare and the advancement of the dental profession by education, science, mutual fellowship and good feeling;…….. “ Thirty members signed the charter on November 4, 1909. For complete SCDS history click here. "The object of the Society was “To promote the public welfare and the advancement of the dental profession by education, science, mutual fellowship and good feeling: by union of effort with the other local organizations as component parts of the Ohio State Dental Society, by the advocacy of proper legislation, and by the cooperation with the medical profession in all matters of mutual advantage to the people of the state.” Thirty members signed before he Charter Membership Roll was closed. Four standing committees were established. 1) Executive, 2) Board of Censors, 3) Membership and 4) Dental Education and Hygiene. The annual dues were three dollars, of which tow dollars went to the State Society. At a second meeting held in the Courtland Hotel, the Members decided to invite the dentists of Carroll, Columbiana, Wayne and Tuscarawas Counties to join with the understanding that all meetings were to be held in Stark County. The First program at this meeting was a paper by Dr. Jackson of Cleveland on “High Pressure Anesthesia” and a demonstration was presented. The January and February meetings of 1910 were held in the office of Dr. J.F. Dougherty. During the Next 4 ½ years they were held at the Courtland or McKinley Hotels. A picnic meeting was held in Zoar on June 15, 1911. Beginning in 1915, the meetings were held at the Elks Club. An outing took place at the Congress Lake Club in May 1916 with automobiles for transportation. Dinners were available at the Elks Club in January 1916 for 75 cents a plate. A year later a “dollar dinner” was tried. Dues also went up to $6.50 in 1917 ab$8 in 1919. Early dental practices had no running water or electric lights. Cuspidors and gas were used, X-ray was unknown in dentistry and there was little specialization and no commercial laboratories. Forceps and cocaine were used. Office hours were form 8 o’clock in the morning to 10 o’clock at night sic days a week. Foot power lathes and dental engines were still in use; Dr. J.F. Dougherty obtained an electric engine in about 1905, probably the first in Canton. Gold inlays were cast by the disappearing model method. Nitrous oxide for general anesthesia began to be used before 1900. Some local dentists made their own nitrous oxide. Vulcanite (rubber) was used for dentures and silicates and gold foil for fillings. Copper cement and silver amalgam were beginning to replace silicates. Educationally, not even a high school diploma was necessary in 1909 to become a dentist. , if one had certain subjects. By 1958, one needed two years of college to gain admittance to a dental school. In 1916 a dental clinic was established at the McKinley Avenue School (Bezaleel Wells) by the Stark County Dental Society, giving free service. Two dentists, Dr. J.W. McGlashan and M.F. Gruber were employed by the school board, each serving a half day five days a week. Later, Dr. Harter W. March, and after him Dr. H.W. McConnell held the office. World War I stimulated many new ideas and methods in dentistry such as the use of gold cast inlays requiring the electric casting engine. Dr. Karl Fischer of Germany introduced Novocain for local anesthesia – a lifesaver for dentists. The United States took over the German patent rights during World War I. Specialization began during the 1919-1929 decade and local dentists at the time had a general agreement the following became the first specialists in their lines: Dr. L.H. Tate in orthodontics (regulating irregular teeth); Drs. A.E. Becker and H.F. Robeson in prosthodontia (artificial substitutes); and Dr. Robert S. Porter in pedodontia (children’s teeth). The depression decade, 1930-39, stimulated the socialization of dentistry as it did of medicine and stirred new concern for children’s teeth/ Techniques begun in the previous decade came into general use such as x-ray, casting of gold inlays, general and local anesthesia and the improvement of porcelains for plates. 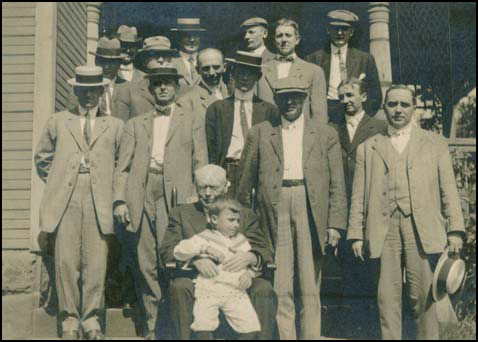 The Stark County Dental Society continued to grow and the attendance jumped to 81 in 1935 following a 25th Anniversary drive for new members, and meetings were shifted to the Onesto Hotel to accommodate the group. The Dental Society organized a dental clinic at the city auditorium to serve the poor during the low years of the depression. Each dentist donated afternoon hours several times a year. The progressive character of the Stark County dentists was shown by their bringing in some 45 speakers from the outside to get the latest word on dental methods. The 15-year war and post war period, 1940-54, was characterized by new methods made possible by perfecting plastics (acrylics), pioneer work in hypnosis in dentistry, widespread use of X-ray, emphasis on children’s dental health, revival of root canal therapy, development of the dental assistants’ organization, growth of Society membership and interest and organized service to the world War II and Korean conflict. While fighting with the dental advertising laboratories on one hand, socialized dentistry and friendliness amongst the profession was developing on the other. Dentists no longer would patent processes, just gadgets and instruments only. The regular meeting place from 1934 to 1947 was the Courtland hotel. Other locations were the Mergus and Sue Ming’s Restaurants. In February of 1952 the Stark County Dental Society (then called the Canton Dental Society) was responsible for fluoridation in the city water supply during the presidency of Dr. H.W. McConnell. This was expected to result in a 50-70% reduction in the decay of children’s teeth. On November 4, 1959, the Stark County Dental Society celebrated its 50th Anniversary at Brookside Country Club under the leadership of Dr. Glen Hostetler, President and Dr. C.I. Pressler, Program Chair. Dr. E.M. Riel of Dayton gave a talk on his missionary work to Hindu patients in India." The Stark County Dental Society celebrated its 100-year Anniversary November 5, 2009, at Brookside Country Club with over 40 past SCDS Presidents in attendance. The members of the Dental Society had worked diligently during 2009 through a major fundraising event and through their own personal benevolence to reach its goal of presenting a $100,000 gift to the Mercy Medical General Practice Residency program. This gift was proudly presented on November 5, 2009. Today, the Stark County Dental Society is proud to be associated with the Stark State College of Technology and works closely to promote and support the Dental Hygiene and Dental Assisting programs at the College. Over 250 dentists belong to the Stark County Dental Society.